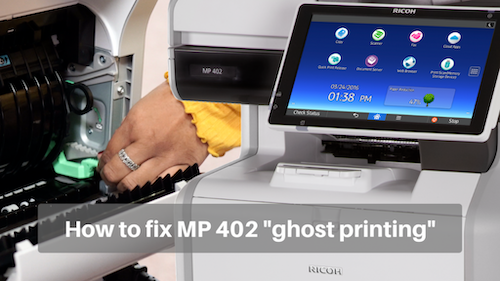 How to Fix MP 402 Print Ghosting/Fading | Duplicating Systems Inc.
Ghosting is a term we use to describe seeing faded images or text on a print that shouldn’t be there. In this example, you see by print 10 the DSI logo has ghosted itself into another part of the paper where it shouldn’t be. A common reason we see ghosting is due to a special lever in the back of the printer. This lever is designed to allow users to run regular paper or envelopes. When the lever is down, it creates enough space between the printer drum and roller to allow envelopes to pass through, so if you are running regular paper through your printer when the lever is down you will see the ghosting effect on your prints. Allow the printer to run through 10-20 prints before the “ghosting” effect disappears. To remove this ghosting effect, push this lever up to the paper mode. If pushing this lever up did not solve your issue of prints ghosting, then please contact your printer company’s service department. I didn’t realize that you can get a ghosting effect on your printer to go away just by pushing one lever in your printer. Since there are so many different components that make such a difference in printing, I wonder if it would be best to just keep a printer service on call. That way, any time a printer or copier stops working, you could call someone with experience in handling those issues.